Sexta-Feira, dia 21 de Março de 2014 às 20:00 horas Friday, March 21, 2014 at 8:00 PM De acordo com o Capítulo 3, Artigo 14 – Parágrafo 1, dos Estatutos em vigor, tenho a honra de convocar todos os Sócios(as) em pleno gozo dos seus direitos, a tomarem parte numa reunião da Assembleia Geral. / In accordance with Chapter 3, Article 14, Paragraph 1 of the current By-Laws, I have the honor to inform all members of their rights, to take part in a General Assembly meeting. A referida Assembleia Geral terá lugar na sede do P.A.C.C. 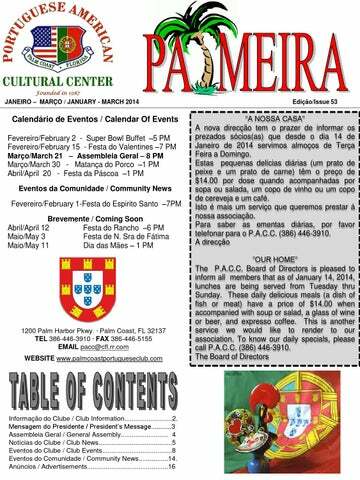 com a seguinte ordem de trabalho: / The referenced General Assembly will take place at the P.A.C.C. with the following agenda: 1. Abertura da Sessão / Open Session 2. Chamada dos Sócios / Roll Call 3. Leitura e aprovação da Acta da Assembleia Geral anterior. / Approval of Minutes from the previous General Assembly. 4. Leitura da correspondência dirigida à Assembleia Geral (se houver). / Reading of any correspondence directed to the General Assembly (if any). 5. Aprovação das contas / Approval of finances 6. Trabalhos pendentes / Pending tasks 7. Novos Trabalhos – Apresentação e discussão de assuntos de interesse para o Clube. / New tasks— presentation and discussion of subjects of interest to the club. 8. Encerramento /Adjournment Solicitando e agradecendo a vossa presença, subscrevo-me com as minhas melhores saudações. / Requesting and thanking your presence, I subscribe myself with regards. A bem do P.A.C.C., / To the betterment of the P.A.C.C., Luis Medeiros Presidente-Assembleia Geral / President-General Assembly Se na hora marcada não se verificar a presença de pelo menos 10% de Sócios(as), a Assembleia reunirá 30 minutos mais tarde com a presença de qualquer nùmero de Sócios(as). / If at least 10% of members are not present at the scheduled meeting time, the General Assembly will meet 30 minutes later with the presence of any number of members. Para sua referência, é favor trazer esta Convocatória consigo para a próxima reunião./ For your reference, please bring this Agenda with you to the next meeting. Para sua referência, é favor trazer esta Convocatória consigo para a próxima reunião./ For your reference, please bring this Agenda with you to the next meeting. O Clube tem uma nova Direcção Na Assembleia Geral do dia 10 de Janeiro de 2014 tomaram posse os novos Corpos Gerentes do PACC. Esta Direcção necessita a vossa cooperação e agradeçe antecipadamente a vossa participação nas actividades e festas do nosso Clube. QUOTAS DE SÓCIO / MEMBERSHIP DUES Lembramos todos os sócios(as) que o pagamento e renovação das quotas deve ser efectuado até ao dia 31 de Março de 2014. Para sua conveniência o escritório estará aberto da Terça a Sexta-Feiras das 3:00 PM às 7:00 PM para aceitar o pagamento das quotas. We would like to remind our members that the payment of dues should be made until March 31st 2014. For your convenience, the office will be open Tuesday thru Friday from 3:00 PM to 7:00 PM to accept payment of dues. PREÇOS/PRICES Sócios/Members: $20.00 Não Sócios/Non-Members: $25.00 Crianças/Children: 14-17: $8.00 Crianças/Children: 0-13: Free MÚSICA/ MUSIC : DJ Orlando / Orlando DJ AGRADECEMOS ANTECIPADAMENTE A QUEM PUDER TRAZER UMA SOBREMESA. WE WOULD GREATLY APPRECIATE IF OUR GUESTS COULD BRING A DESSERT. AGRADECEMOS ANTECIPADAMENTE A QUEM PUDER TRAZER UMA SOBREMESA. WE WOULD GREATLY APPRECIATE IF YOU COULD BRING A DESSERT. PREÇOS/PRICES: Sócios/Members: $35.00 Não Sócios/Non Members: $40.00 Crianças/Children: 14-17: $15.00 Crianças/Children: 0-13: Free AGRADECEMOS ANTECIPADAMENTE A QUEM PUDER TRAZER UMA SOBREMESA. WE WOULD GREATLY APPRECIATE IF OUR GUESTS COULD BRING A DESSERT. Para billhetes ou mais informação, por favor contacte: For tickets and more information, please contact: Victorino or Conceição at 386-237-5512 or 386-446-0819 Manuel Sousa at 508-265-0202 Jennifer Cabral at 386-263-2340 Irmandade Do Divino Espirito Santo Inc – A non-profit organization AGRADECEMOS ANTECIPADAMENTE A QUEM PUDER TRAZER UMA SOBREMESA. WE WOULD GREATLY APPRECIATE IF OUR GUESTS COULD BRING A DESSERT. Abel e Quina De Almeida ao celebrar 50 anos de matrimónio com a sua família em New Jersey. Parabéns! Se desejar pôr um anúncio neste boletim, por favor chame ou visite o Clube e deixe o seu nome e número de telefone no escritório e alguém o contactará. ----------------------------------------------If you would like to place an ad in this newsletter, please call or visit the club to leave your name and telephone number at the office and someone will contact you. INVESTIMOS NA QUALIDADE Moradias estilo mediterrâneo á venda e prontas a habitar. Não perca esta boa oportunidade de comprar ou construir a casa “Ideal” dos seus sonhos. Ligue-nos já, e faça parte da família de clientes da Ideal Homes. Adelino Marçal e Família vêm por este meio agradecer a todos/as sócios/as que assistiram às cerimónias fúnebres da sua esposa Maria (Filipa) Valentim, mandaram flores, encomendaram Missas ou por qualquer outra forma apoiaram a família. Bem hajam. ForFor years years youyou have have heard heard meme beat beat thethe drum drum of how of how risky risky investing investing in the in the markets markets viavia Stocks, Stocks, Bonds, Bonds, Mutual Mutual Funds Funds andand Variable Variable Annuities Annuities cancan be.be. I recently I recently found found twotwo charts charts (see (see page page 2) that 2) that willwill give give youyou a better a better visual visual of this. of this. WeWe all all go go through through three three stages stages of of lifelife (a)(a) Accumulation Accumulation (b)(b) Preservation Preservation andand (c)(c) Wealth Wealth Transfer. Transfer. Stage Stage oneone is the is the “Accumulation “Accumulation Period”; Period”; thisthis is when is when youyou areare working. working. If you If you suffer suffer a market a market lossloss during during thisthis time, time, thethe results results areare notnot near near as damaging as damaging as as youyou areare stillstill working working andand have have thethe time time to recover. to recover. However, However, several several of my of my client’s client’s children children have have contacted contacted meme recently recently andand expressed expressed thatthat they they don’t don’t want want to invest to invest with with riskrisk anyany longer; longer; thethe youngest youngest thus thus farfar is 27 is 27 years years old.old. TheThe second second stage stage of life of life is the is the “Preservation “Preservation Period”; Period”; thisthis is when is when youyou areare near near or in or retirement in retirement andand must must protect protect your your assets assets to provide to provide income income forfor thethe remainder remainder of of your your life.life. TheThe unknown unknown is how is how long long thatthat willwill be be andand what what effect effect inflation inflation willwill have have on on your your money. money. Increased Increased taxation taxation andand rising rising outout of pocket of pocket costs costs associated associated with with healthcare healthcare may may have have a detrimental a detrimental impact impact on on your your savings savings as well. as well. Warren Warren Buffett Buffett said, said, “The “The number number oneone rulerule about about investing investing is don’t is don’t lose lose anyany money money andand number number twotwo is not is not to forget to forget rulerule number number one.” one.” In looking In looking at the at the chart, chart, youyou cancan seesee thatthat if aifloss a loss in incurred in incurred of 20%, of 20%, youyou must must earn earn 25% 25% to recover. to recover. If the If the losses losses areare 40%, 40%, youyou must must make make 66.67% 66.67% to get to get back back to where to where youyou were. were. This This equates equates to 17 to 17 years years given given an an annual annual raterate of of return return of of 3%.3%. No,No, I don’t I don’t have have anyany idea idea when when thethe next next market market correction correction or crash or crash willwill occur, occur, butbut there there areare many many factors factors thatthat cancan negatively negatively impact impact thethe markets markets such such as wars, as wars, political political turmoil, turmoil, actsacts of terror, of terror, high high unemployment unemployment andand let’s let’s notnot forget forget thethe national national debt debt which which is approaching is approaching $17.5 $17.5 trillion trillion dollars. dollars. A recent A recent report report noted noted thatthat over over 90 90 million million fellow fellow Americans Americans areare no no longer longer working working andand folks folks thatthat is aisstaggering a staggering number. number. I know I know thatthat some some of you of you stillstill have have money money in the in the markets, markets, is the is the riskrisk really really worth worth it? it? That That brings brings us us to stage to stage three, three, “The “The Wealth Wealth Transfer Transfer Period”. Period”. With With lessless people people working working andand thethe need need to raise to raise additional additional taxes taxes to fund to fund entitlement entitlement programs programs likelike Medicaid Medicaid andand “Obamacare”, “Obamacare”, thethe GAO GAO (Government (Government Accountability Accountability Office) Office) hashas stated stated thatthat $1 $1 trillion trillion willwill be be needed needed to help to help fund fund thethe new new healthcare healthcare law. law. Where Where do do youyou think think thethe Government Government is looking is looking to make to make up up thisthis shortfall? shortfall? If you If you guessed guessed your your retirement retirement assets assets as they as they areare passed passed to you to you heirs, heirs, youyou areare 100% 100% correct. correct. However, However, wewe now now have have “Tax-Free” “Tax-Free” wealth wealth transfer transfer tools tools available available to to minimize minimize thisthis impact. impact. If you If you own own an an annuity annuity or IRA/401k or IRA/401k plan plan andand areare under under ageage 80,80, I can’t I can’t encourage encourage youyou enough enough to make to make an an appointment appointment immediately immediately to see to see if you if you qualify qualify forfor these these programs. programs. If action If action is not is not taken, taken, up up to 36.9% to 36.9% of the of the account account may may be be confiscated confiscated andand redistributed redistributed to someone to someone other other than than your your family family or loved or loved ones. ones. The number one reason people suffer losses regardless of whether it is due to the markets or taxation is PROCRATINATION. I urge you to take action now to minimize the inevitable. See page 3 for our upcoming seminars in Ormond Beach and Amelia Island as we always encourage you to attend! Fred Hackney is President and Founder of Hackney & Associates in St. Augustine. Mr. Hackney specializes in the areas of IRA/401(k) plan distribution, tax strategies and income planning. He lives in St. Augustine and is a member of The Portuguese American Cultural Club. To schedule a complimentary consultation call Melissa at (888)7536664. God Bless, Fred Hackney, Owner of Hackney & Associates Fred Hackney is President and Founder of Hackney & Associates in St. Augustine. Mr. Hackney specializes in the areas of IRA/401(k) plan distribution, tax strategies and income planning. He lives in St. Augustine and is a member of The Portuguese American Cultural Center. To schedule a complimentary consultation call Melissa at (888)753-6664.